The average NFL fan would likely have a difficult time picking out Treyvon Hester from a lineup of NFL players. The average Philadelphia Eagles fan, however, could do it in a heartbeat. The interior defensive lineman, in just his second season in the NFL, is showing up for his team — along with numerous other unsung players — when it needs it most. Hester, safety Tre Sullivan, cornerbacks Cre’Von LeBlanc and Rasul Douglas and tight end Dallas Goedert have all done their part in turning a once-hapless 4-6 team into that of a playoff-caliber one. Goedert was the highest graded tight end on Wild Card weekend by a large margin — he earned an 86.8 overall grade, 15 points more than the next closest player. But the 2018 second-round pick struggled to get involved out of the gate, failing to post a grade higher than 80.0 in his first 13 games. Since then, he’s finished three games with an 85.0 grade or higher, and he has generated passer ratings of 100.0 or better in four of his past five games. In other words, the prized rookie target is coming into his own when the Eagles and Nick Foles need it most. 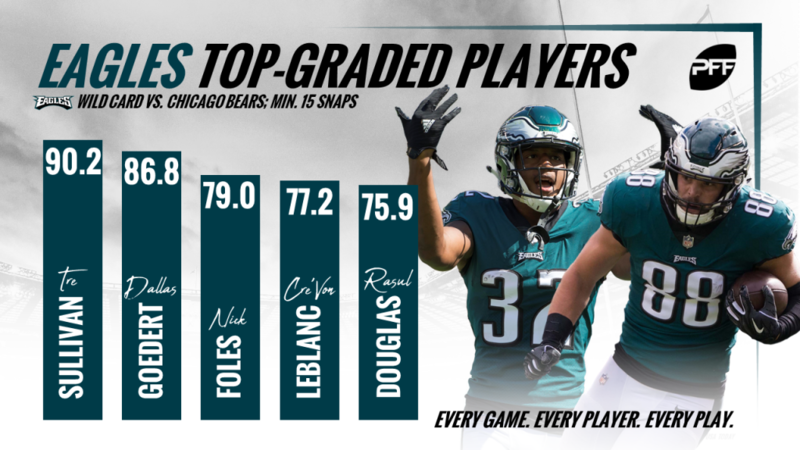 The most surprising performances of the Eagles’ win over the Chicago Bears came from defensive backs Cre’Von LeBlanc and Tre Sullivan. Both were former undrafted free agents in 2016 and 2017, respectively, and both had regular season grades below 65.0 entering Sunday’s contest. The Foles magic must have spread against the Bears in the win-or-go-home scenario. Sullivan played a career-high 48 snaps and managed three pass breakups by himself when all the other safeties on Wild Card weekend managed three combined. The second-year safety out of Shepherd hadn’t had a pass breakup all season in 223 snaps and had yet to eclipse a grade higher than 75.0. Yet, on Sunday, he was the Eagles’ highest-graded player (90.3). As for LeBlanc, he seemingly came out of nowhere to stabilize an inconsistent and banged up coverage unit. The Eagles signed him midseason and have since gotten more than expected from the third-year man already on his fourth team. His 77.2 grade against the Bears, his former team, was third among all cornerbacks this postseason and he hasn’t allowed a touchdown in coverage since Week 11, despite facing 46 targets since then, the fourth-most at his position. He and fellow cornerback Rasul Douglas have been tough to beat in recent weeks. No cornerback duo has faced more targets than LeBlanc and Douglas over the past four weeks (67 targets). Only three passes targeted 20 or more yards downfield have been completed in their coverages in the span, including 0-for-2 into LeBlanc’s coverage on Sunday. Just as the Eagles experienced the unthinkable a season ago under Foles, they’re now one step closer to achieving a similar fate. And a lot of that has to do with young, unheralded players making plays in pivotal moments. Treyvon Hester has quietly been having a stellar season on limited snaps — and he cemented it with a game-winning blocked kick to send his city into an all-too-familiar frenzy. While his 48.2 grade on Sunday was by far his worst grade of the season, what he did in the regular season for a team already filled with stars on the defensive line was unprecedented. His 89.7 grade ranked 14th among interior defensive linemen, and his 87.5 run defense grade ranked 10th. Hester’s grade over the last four weeks of the regular season also ranked 10th, and while the former Oakland Raiders seventh-round pick has seen only 10-20 snaps a game, he’s making the most of it. It’s hard to count anyone out on this Eagles team because as it has shown, anyone and everyone could step up when it matters most in any facet of the game.